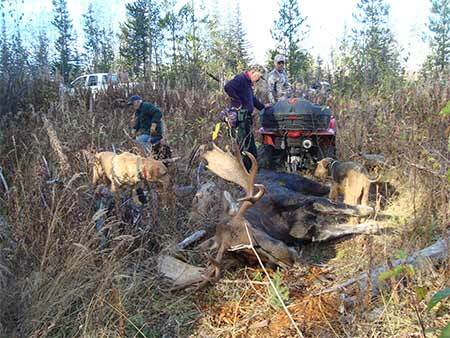 Our archery moose hunt did not go as planned this year. We went very early, did our research and found out where the moose were hanging out. We were able to get some great photos and video. I got a shot at a bull, I thought it was a good shot too. It turns out the arrow must have hit just a bit too low, maybe the brisket? 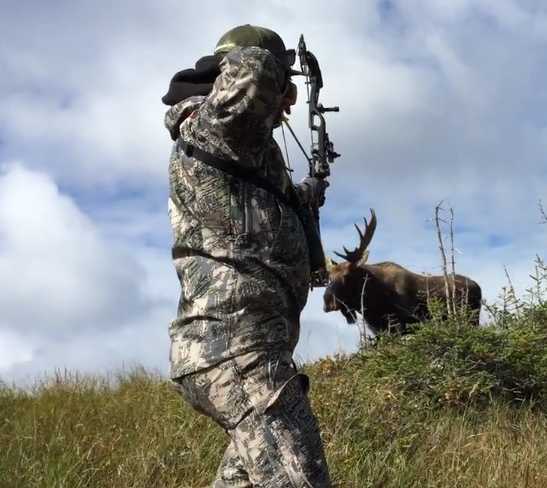 After the arrow hit (broadside at about 30 yards) the bull turned and started to run. I cow called and he stopped and looked back. After a moment he started to walk away, took only a couple of steps and laid down. I figured he was going to expire right there! I returned to where I had been calling from to give him time to die. I was unable to see where he lay from this vantage point so I chose to climb the tree beside me to gain a clear vantage point. Once up the tree about 15 - 20 feet, I turned to locate the bull... much to my amazement I looked just in time to watch him walk into the timber on the far side of the meadow (about 300 yards away). I wasn't sure what to think at the time? I decided maybe he had enough energy to get off the meadow and into the trees to die. I returned to camp, to get Dad and see if I could solicit help from the other hunters in our campsite. We returned to the area about an hour or more later and started to follow the blood trail. At first the archery moose hunt blood trail was easy to follow, lots of blood... but it quickly dissipated? Oh this is not so good! There were 3 of us looking and we scoured the area thoroughly. We found the broken arrow and where he laid down once; there was a little bit of blood where he lay, but not very much. It was by sheer chance that we found where the bull had bed down to watch his back trail. Archery moose hunting is a tough game. I think in the end the bull will survive, the wound will heal over and he'll still be in the same area next season. We called off the search after looking for about 5 hours. He couldn't have been hurt very bad, as after the blood trail stopped we only ever found the one bit of blood where he had bed down. It had been an exciting morning for me. I was working a bull for over an hour; he kept his distance and kept trying to circle me to get my wind. My back was to the lake and the wind was in my favor. When he started to tire of not seeing a cow he began to move off. I became more aggressive in my calling and started to rub against brush as though I were a cow moving in his direction. He turned back toward me. I kept moving ever so slowly and carefully in his direction while at the same time he also was coming towards me. Then I spotted him through the willows... a nice bull. He was screened by a lot of brush and still 50 - 60 yards away. As I contemplated my next move, I looked to my left and there in the wide open was a second bull staring in my direction. Oh now what? A Friend's Successful Moose Harvest - 51"
Anyway this second bull was facing me at about 60 yards, and he too was screened by willows. At about this point in time the first (larger bull) started to move to my right and seeing the movement the smaller bull began to follow. As he crossed an opening at what I thought was about 20 yards, I grunted and he stopped in his tracks. I stepped out from behind the willow, I came to full draw, aimed and fired. I watched the arrow hit what I thought was going to be a slam dunk! Broadside through the vitals! I guess though the shot must have been just a little too low. This was the first time in 22 years that I came home without a moose. Very disappointing to say the least.